What better way to start the new year than with some breeding projects? With many of my females maturing, it’s time for me to get going on some of the breeding projects I’ve been anticipating. First up is a pairing between my mature male and female Poecilotheria regalis. I was very fortunate that this male and female, purchased separately as a sling and a juvenile respectively, matured at about the same time. Although I was cutting it a bit close (the male had his final molt a couple months ago), everything eventually fell into place nicely. The female was purchased as a 2.25″ unsexed juvenile about 22 months ago. Her last molt was on December 2, and since then I’ve fattened her up a bit with three large dubia roaches and a hissing cockroach. She is currently about 7″ in length. The male was purchased about 14 months ago as a 1.5″ sling and had its final molt in early November. He’s been observed tearing down sperm webs a couple times over the past several weeks, so he’s been ready to go. Although I would have ideally used this male earlier to breed, I wanted to wait until my female molted out one more time and gained a bit more size. He is currently about 6.5″. Introducing the male and female. I’d considered a few ways to introduce the two potential mates to each other. Courtships can last quite a while for Pokies, and I reasoned that I might not be able to sit by with a camera and hope to catch the process. I was also hoping to leave them overnight as to offer a dark, noise-free breeding environment. 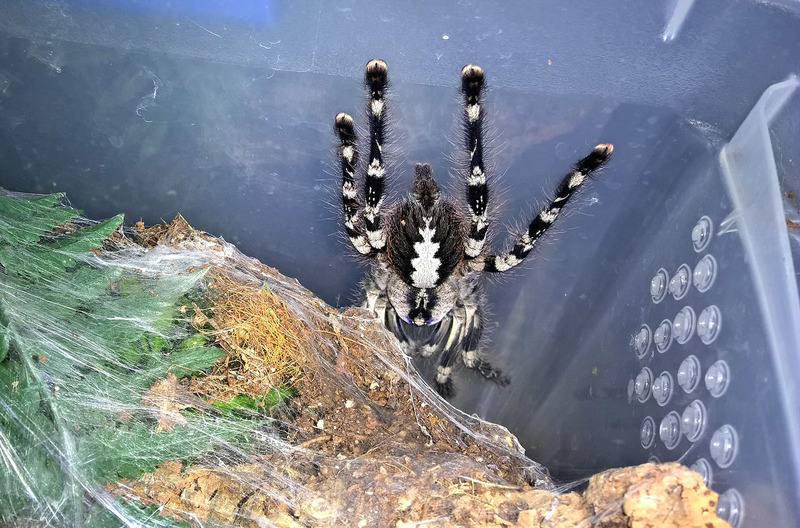 As Poecilotheria species are rather tolerant of each other (as evidenced by the many successful communal set-ups out there), most keepers reported that they allowed the two specimens to remain in the same enclosure unsupervised anywhere from overnight to a week. I planned to keep them together for an evening. I had read about “shark tanking/shark caging”, which is when the male is added to the female’s enclosure for a few days while inside a smaller enclosure to protect him. The idea is to allow the pair to get accustomed to each other while still keeping the male our of harm’s way. Eventually, the male is released so that he can mate, hopefully with less risk of getting eaten by the female. I know that several keepers have used this technique with some success, but the breeders who I have spoken to had not used shark tanking with the successful pairings of their Poecilotheria species. Also, the size of my female’s enclosure wouldn’t have allowed the space needed for this practice, so it became a moot point. I also considered capturing the male and carefully introducing him directly into the female’s enclosure. Again, however, I worried that the size of the enclosure might not be conducive, as a spooked male might run directly into the female, getting munched before he could do his thing. Also, if the male was able to successfully insert, my female’s enclosure would offer minimal space for escape should she then decide she was hungry. 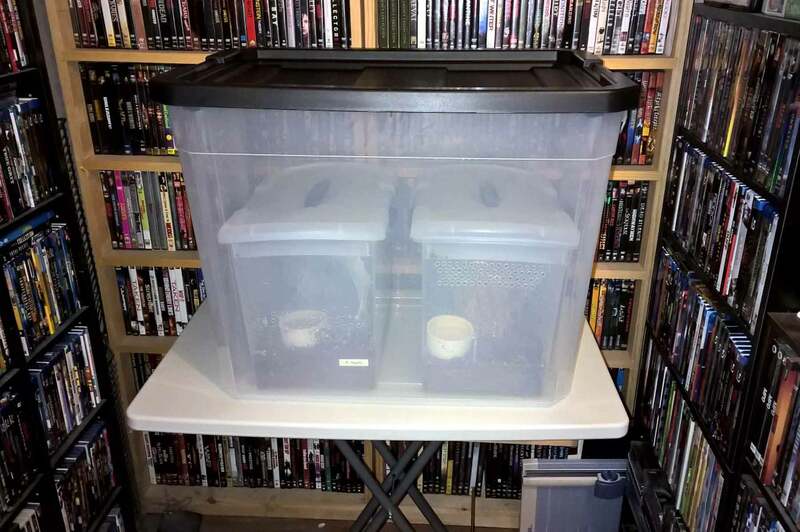 After measuring the two containers that housed my specimens, I decided that I would buy a much larger enclosure that would accommodate both the cages. With this setup, I would be able to put both enclosures in, open the tops, and let the spiders find each other on their own. This would avoid spooking the tarantulas during the introduction and allow them to encounter each other as they might in the wild. This breeding tank also offered plenty of free space should the male need to beat a hasty retreat. A “breeding chamber” for my P. regalis pair. Both pokie enclosures were place inside this larger enclosure and their lids removed. 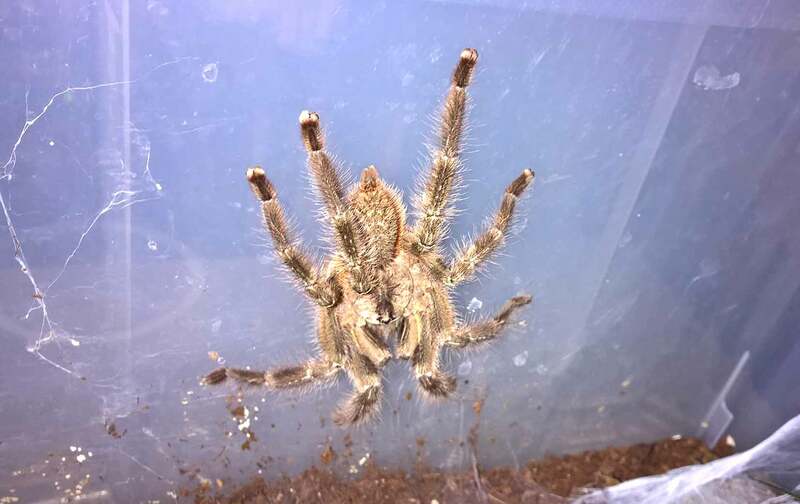 The tank I chose was a 27-gallon latch-able Sterilite container that offered enough floor space and height to allow the spiders to mingle on neutral territory. I used my soldering iron to put ventilation holes in both sides to allow for air flow, and I placed it on a small table in a corner of my tarantula room that doesn’t get much traffic. I placed both enclosures in the breeding chamber earlier in the day, but I waited until the evening to take the tops off. Within an hour, both had started to crawl out of their cages to explore. Just before bed, I observed both the female and the male drumming their legs as they courted. I’m taking this as a good sign that their may have been an insertion after I went to bed. When I turned the lights out, they were still at opposite ends of the enclosures continuing their courtship ritual. I left them in unsupervised overnight, and when I checked on them in the morning, both were fine and perched in opposite ends of the larger enclosure. All told, they spent about 14 hours together, with about 10 of that being in darkness. I left them a bit while I had my morning coffee so I was awake enough to wrangle them both back into their cages. As it turns out, I didn’t need the coffee; each had returned to his and her respective enclosures while I was gone. I couldn’t have asked for an easier pairing. Although I’m pretty optimistic that the two mated last night, I’m going to go ahead and try again next weekend while I still have the male. After that, it will be a watch-and-wait game as I hope to discover the female is gravid. With any luck, I’ll have a sac in a few months. I will not only post a blog update if I have any news, but I will also update this post. Next up … it’s time to find a date for my female P. vittata. Good luck. Hope you get lots of babies. Pretty old message board, but hey! Did you end up having any luck breeding your pokies?? Wanting to do this soon myself. Hi, Erik! Unfortunately, the female molted out before laying a sac, and the male died before I could try again. I’m hoping to breed another pokie species this summer.